A scene at the ‘Scrap the Pork’ rally and musical concert held at Plaza Quezon in Naga City and joined by MPCF-Camarines Sur students and staff which denounced the highly anomalous and illegal pork barrel system of Senators and Congressmen. Amy Lanuzo (extreme left) of the Office of Research and Extension(ORES) pose with maritime cadets who supported the protest for honest and clean governance. Naga City – The students and staff of Mariners Polytechnic Colleges/Foundation (MPCF) in Camarines Sur joined the ‘Scrap the Pork’ rally and musical concert staged at Plaza Quezon, this city on August 25, 2014, coinciding with the country’s observance of National Heroes Day. The more than one-hundred strong contingent of the school was led by Vice President for Administration Napoleon Mangente who was one of the Speakers during the event dubbed as ‘Bayani Ako, Naninindigan’ or ‘I am a hero who makes a stand’. VPA Mangente in his speech pushed for the abolition of all kinds of ‘pork barrel’ of legislators and other public officials which give them the discretion on what to do with lump sum government funds amounting to millions or even billions of pesos which tend to be abused by those in power. “The wasted government money which went to corruption could have been used in subsidizing the education of children especially those coming from marginalized families”. declared Mangente during the rally. Other speakers went to encourage Filipinos and the Bicolanos to join and support the movement as the time for being complacent is over. Meanwhile, the assembly-participants were entertained by local bands which rendered Pilipino patriotic and protest music popularized in the past, mostly during the martial law era (1972 to 1986). (Left picture) The streamers that hang at Plaza Quezon while the event goes on. (Right picture) The stage where the bands played their piece at the protest rally and concert. Meanwhile, the assembly participants were entertained by local bands who rendered Pilipino patriotic and protest songs popularized in the past, mostly during the martial law era (1972 to 1986). The Mariners’ Tourism and Hotel Institute at MPC-Naga is utilized as laboratory hotel and restaurant by Mariners students taking up Tourism, Hospitality and Business courses, giving due advantage to enrollees with a state-of-the-art setting and competent instructors. 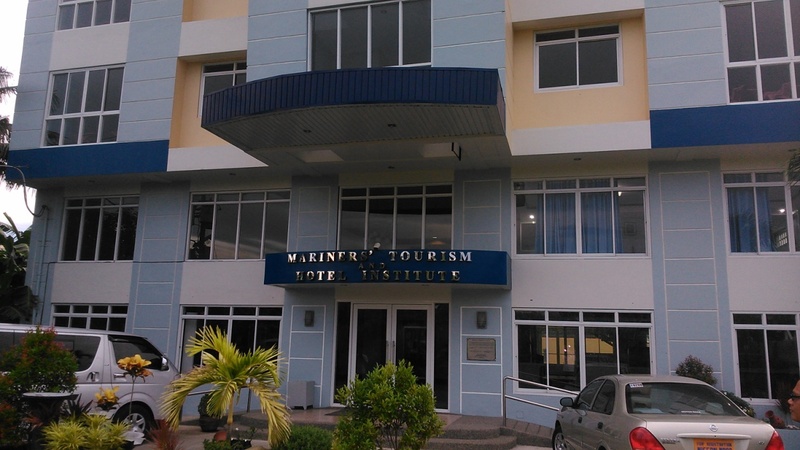 The Mariners System takes pride in the establishment of the five-storey laboratory facility, the Mariners’ Tourism and Hotel Institute (MTHI) of Mariners Polytechnic Colleges (MPC) in Naga City which has become a milestone for the institution and a landmark when it comes to the school’s academic offering in the field of Hospitality, Tourism and Business courses. MPC-Naga Assistant Human Resource Department Director Alfred Karlo J. Ampuan who just came from the United States after his stint in guiding students who joined the ‘Work and Travel U.S.A.’ project has made the observation that indeed, the founding of the Mariners Hotel has perked –up the courses benefited by this new competence. 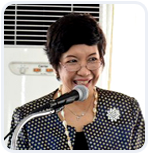 “These innovations have placed our school prominently in the local academic map especially in the fields of Tourism, Hospitality and Business courses as the tools which the students need are just around and they do not have to go far just to be able to have access to the facilities they need in their studies”, declared Assistant Director Ampuan. 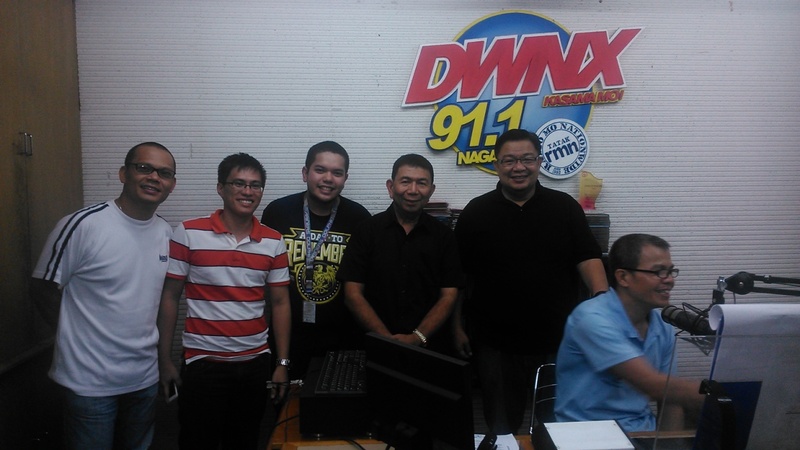 MPC-Naga Assistant HRD Head ALFRED KARLO J. AMPUAN (3rd from left) poses with another featured guest, MPCF – Cam Sur Customs Administration graduate Hashim Banaga (2nd from left in red & white striped shirt) and the radio show Anchors of Mariners System’s BUHAY MARINERO program aired once-a-week by Mariners System. It can be recalled that after the OJT stint of Mariners HRM students in America, they brought home the common observation that the facilities used by the school are comparable to the gadgets actually used in the hospitality enterprises in the United States where they worked. They say it was not a surprise to them to see the set-up in five-star hotels and restaurants as they have already seen and used them in school. The students also observe that what is taught in school are updated and it was what they experienced being practiced in the hospitality enterprise where they were assigned in their on-the-job training. With these developments at Mariners-Naga, it has become an institution which has turned its educational system at par with international standards especially when it comes to the Tourism and Hospitality courses it offers. 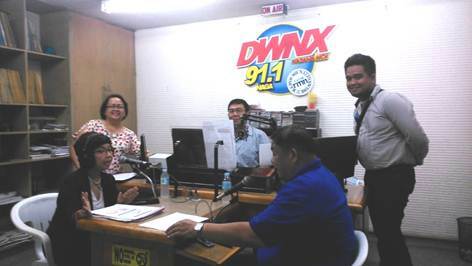 Dr. Marilissa J. Ampuan (extreme left) explains on-the-air at the Mariners System’s radio show ‘Buhay Marinero’ over DWNX of Radio Mindanao Network the details of the K to 12 Program. With her (left to right) are ORES head Dr. Mariel Estrella, Program Anchors Elmer Abad & MPCF-Camarines Sur VP for Administration Nap Mangente (in blue shirt) and Arvee Osma of MPC-Naga. Naga City – Dr. Marilissa J. Ampuan, President of Mariners Polytechnic Colleges (MPC) this city and Chairperson of the Board of Trustees of Mariners Polytechnic Colleges Foundation (MPCF), Canaman, Camarines Sur has discussed the Department of Education’s ‘K to 12 Program’ which is about to be implemented by the different educational institutions in the country. This was made in an interview in the radio show ‘Buhay Marinero’. 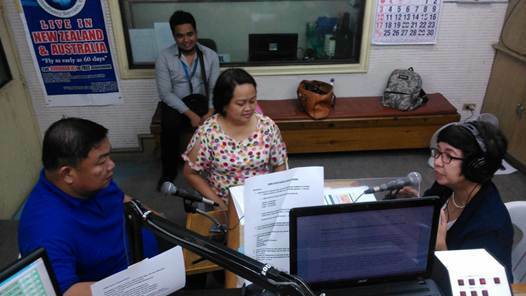 She informed the listeners on the level of preparedness of the schools under the Mariners System in its implementation as mandated by law although she admitted there can be some difficulties which can be encountered by the institutions in the process of executing the program. Dr. Ampuan sees the advantages in this scheme and considers the challenges that could crop-up as something temporary. With this development, the students are expected to be more prepared and focused towards the direction of the career they want to embrace and are expected to be productive earlier in their lives. Aside from the ‘K to 12 Program’, MPC-Naga President Dr. Marilissa J. Ampuan (extreme left) also reported on their recent mission trip to the Republic of Vietnam which she and Dr.Mariel Estrella (center) undertook which aims at establishing linkages with Tourism and Hospitality establishments where students of Mariners can go for their On-the-Job Trainings. On the part of the schools, they are mandated and expected to make the necessary adjustments in conformity with the system now about to be implemented by the Department of Education. Dr. Estrella (left) and Dr. Rosales (right) on their presentation during APTA held in Vietnam recently in July 2014. The Mariners’ Polytechnic Colleges (MPC) in Naga City through Its President Dr. Marilissa J. Ampuan, the ORES Director Dr. Mariel R. Estrella, and researcher Dr. Gladys G. Rosales presented two research papers in the 20th Asia Pacific Tourism Association (APTA) held in Ho Chi Minh City, Vietnam on July 1-4, 2014. Fostering Partnerships in Tourism Development in Camarines Sur, Bicol Region, Philippines: The MPC Experience. The first paper basically promotes the concept of developing a balanced economic development through tourism. The project explored the possibility of bringing the coastal communities like Itangon, Bula, and Cagsao, Calabanga in the hub of development which is Naga City. On the other hand, the second paper showcases the developing partnership between MPC and the Local Government Units (LGU) in Camarines Sur and in Bicol Region as a whole. This highlights the Private-Public Partnership (PPP) which is one scheme in tourism development. This is likewise relevant as the conference had the theme “Development of Regional Tourism by Collaboration Between Public Sector and Academics in the Asia Pacific Region”. MPC had established its niche in hospitality education. In Naga City and in the neighboring municipalities, its faculty members are being tapped as speakers, researchers, coaches or mentors in the field of tourism. During the parallel sessions, the participants had a good intellectual exchange of research breakthroughs and the current trends in tourism such as its development, its potentials, the tourist behavior, and destination management. Studies on Heritage Tourism, Medical Tourism, and Education in Tourism and Hospitality were likewise presented. A total of 156 papers were presented from Asian countries like Philippines, Hongkong, Malaysia, Indonesia, Japan, Thailand, Taiwan, Vietnam, Macau, China, and India. Australia, USA, and Canada likewise joined the international conference. It can be recalled that in the past years, MPC had actively presented in the annual APTA conference held in Macau, Korea, and Taiwan.